I have always wanted to dine on a steam train, in fact it's one of the items on my 40 Before 40 Bucket List I don't know exactly what it is but enjoying food with my husband on a beautiful old steam train chugging its way through stunning landscape just sounds so romantic to me. 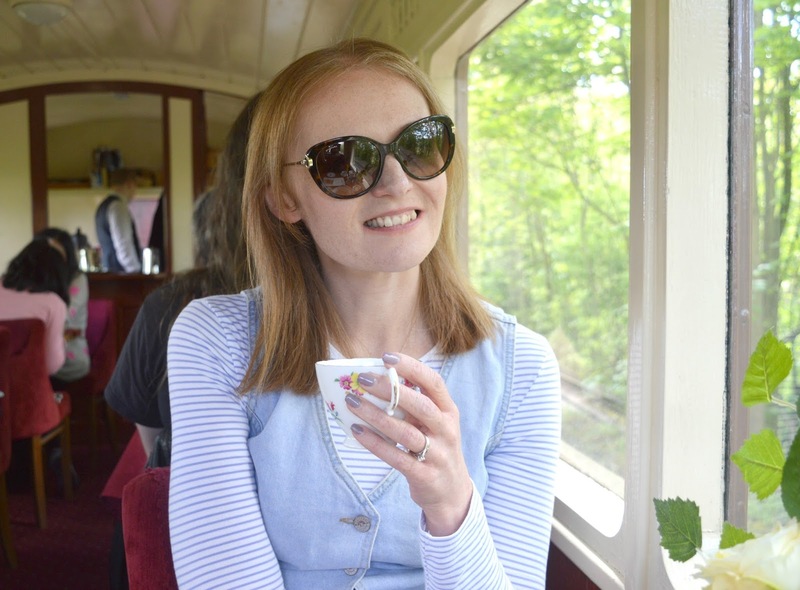 So this year I decided it was time to tick it off the list and I booked us an afternoon tea on the Tanfield Railway. 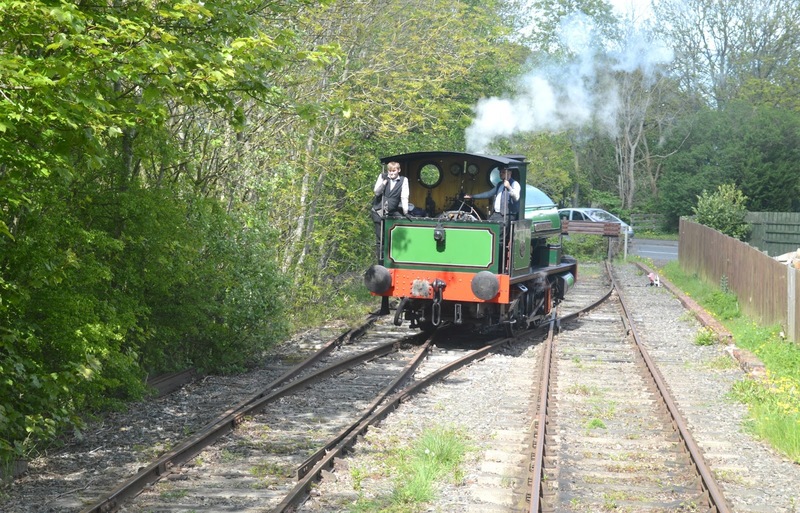 The Tanfield Railway in Gateshead is the world's oldest railway. 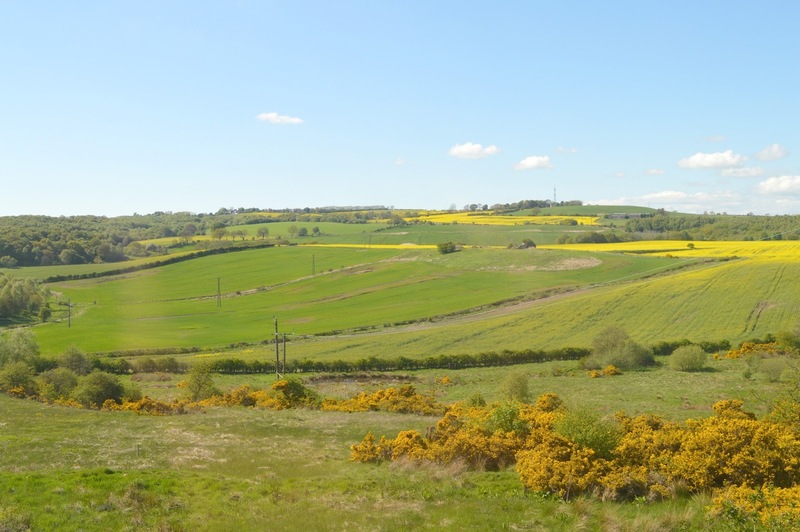 Riding the 6 miles of track in beautiful Victorian carriages through the picture perfect wooded valleys of Gateshead and Durham is the most relaxing way to spend an afternoon. An important part of North East history, the railway dates back to 1725 when the line was built to transport coal from colleries in the Tanfield area to the River Tyne for shipment and, if you're keen to learn more, the Marley Hill Engine Shed is the oldest working engine shed in the world where you can take a closer look at the steam engines. 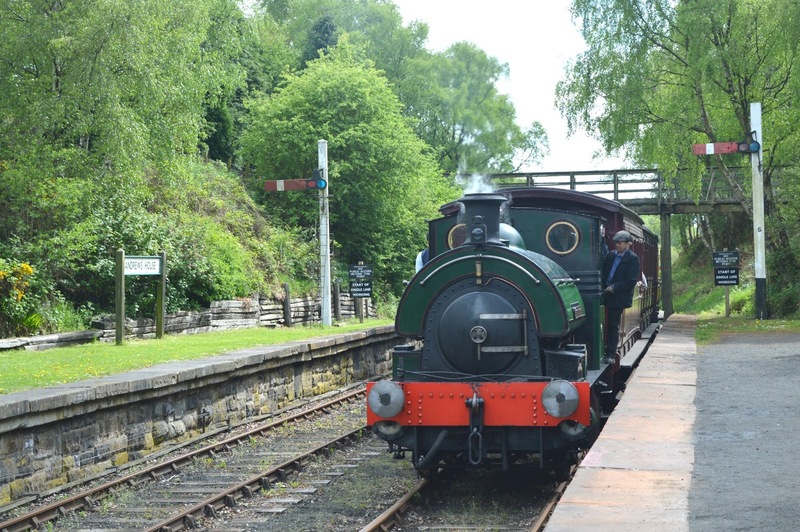 There are four stops along the Tanfield Railway - Sunniside, Andrews House, Causey Arch and East Tanfield and if you book a ticket for afternoon tea you're able to travel on the trains all day and hop off at any stations that you fancy. A great way to get some fresh air and a leg stretch after indulging in your afternoon tea, there are some beautiful walking routes alongside some parts of the track and if you want to explore the Causey Bridge, the world's oldest railway bridge it's definitely worth getting off the train for a proper look. Our Afternoon Tea train departed Andrews House at 2:40 pm and we were welcomed aboard the Director's Class carriage at the front of the train. Another slice of amazing railway history, the carriage was built in 1875 as an inspector's saloon for senior officers of the North Eastern Railway. The Director's Class Carriage is most definitely the loveliest way to journey down the train track, a small carriage with a handful of tables and super comfy chairs, there were around 18 of us sitting down for Afternoon Tea and we had the most fantastic views. The engine of the train changes position at various points during the journey so we either had a fantastic look at the front of the train or the most beautiful open scenery at the back of the train. When we booked our tickets we could select which table of the carriage we wanted to sit at, with tables set for either groups of two or four. We were shown to our table which was already laid out with our beautiful traditional crockery and a large plate of sandwiches. 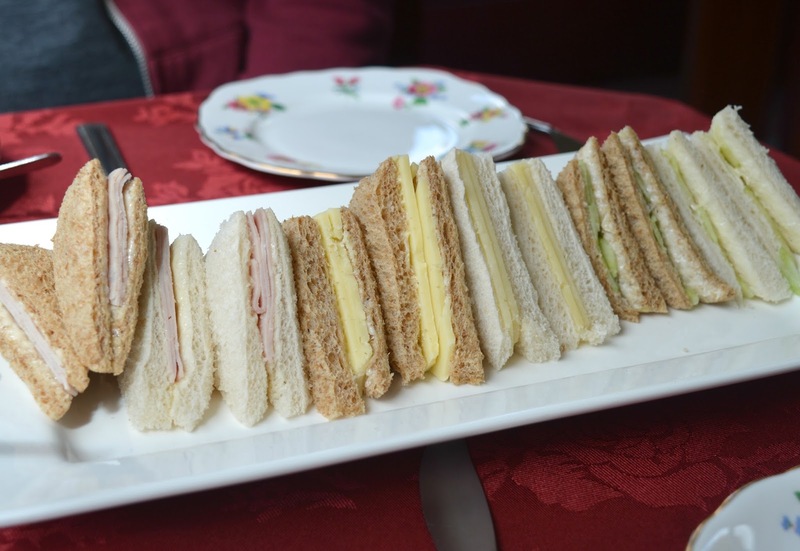 They were Afternoon Tea classics - ham, cheese and cucumber with the crusts cut off and a generous spread of butter (whoever made these sandwiches needs to come and make me my lunches for next week because they are on the same page as me with the butter). 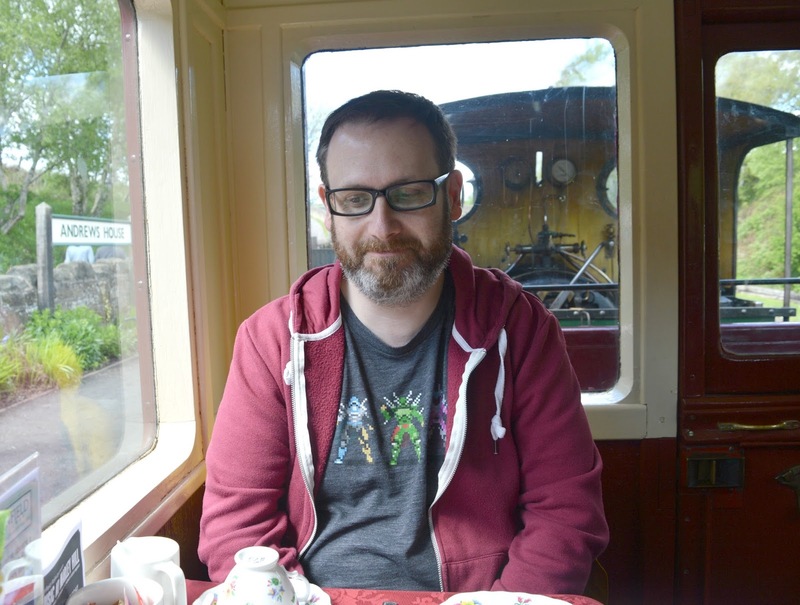 Eating afternoon tea on an old steam train is so much fun. As soon as we set off our cups were rattling away and I just loved it. Tea was served to us at the table, with just a splash served each time to prevent spillages, it's pretty much impossible not to make a mess when you're pouring tea and milk on a moving steam train. We were very thankful we weren't in charge of the teapot ourselves and there were endless refills available whenever our cups were empty. 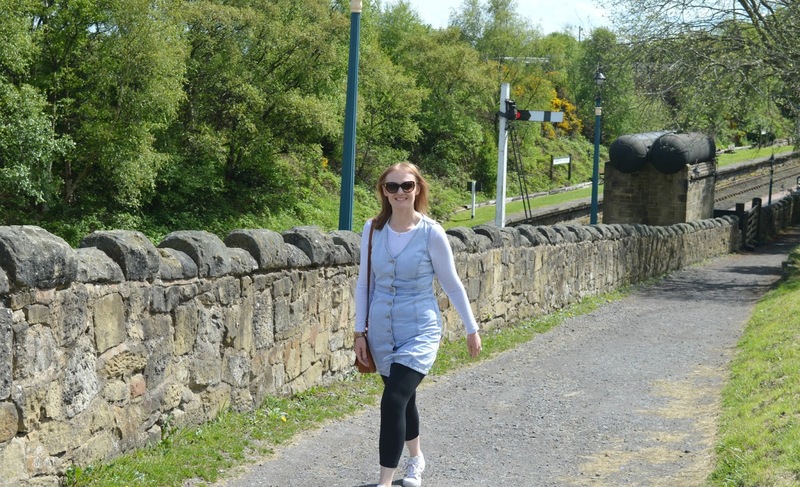 Clattering our way down the train tracks sipping on tea and admiring the beautiful views of the Gateshead and Durham countryside was the most blissful way to spend a sunny Sunday afternoon and if you're planning to travel on the Tanfield Railway I'm convinced that this is the best way to do it. Once we'd cleared our sandwiches (no prizes for guessing which table polished the plate off first!) the cakes arrived. We each had a scone, a large slab of Victoria Sponge and a Strawberry tart. Whilst the food definitely won't win any prizes for being the fanciest or best Afternoon Tea in the North East the experience of eating it on the steam train really made it all taste extra delicious. There was no cream served with the scones (you should have seen my shocked face) so I came up with the genius idea of scooping cream off my strawberry tart to cover my scone, then swapped my tart for Simon's when he wasn't looking. I'm sure I would have got away with it if I hadn't been laughing so hard I had tears rolling down my face! Having completed the challenge of managing to cut my scone with a knife on a very wobbly train, comedy moment of the journey arrived when the table next to us lost one of their cakes off the top tier and it landed (with amazing precision) into a man's teacup! It really is so much fun eating afternoon tea on a steam train! Just as we finished up our delicious cakes the train made a brief stop and the guard stepped into our carriage to ask if any of us wanted to have a proper look at the engine. We had no idea this was going to happen, and we were over the moon that our carriage was getting the opportunity to have an up close look at the train. 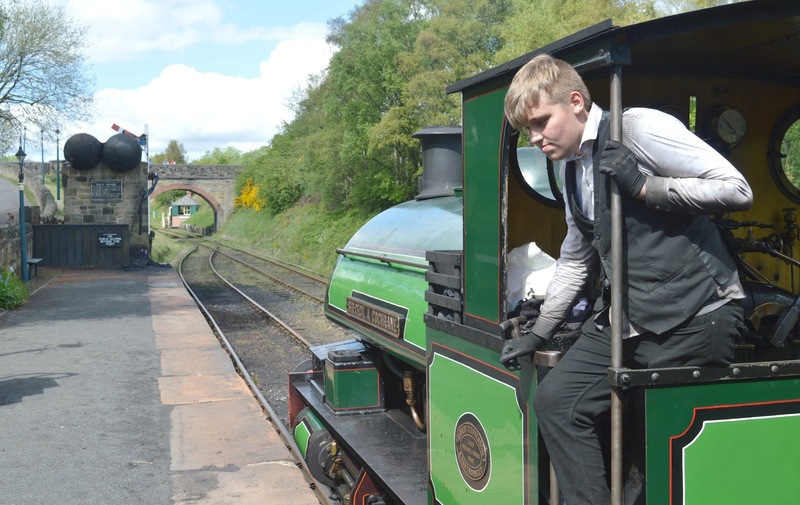 The young lads driving the train were so lovely and huge fans of railways and engines so they were really interesting to chat to. 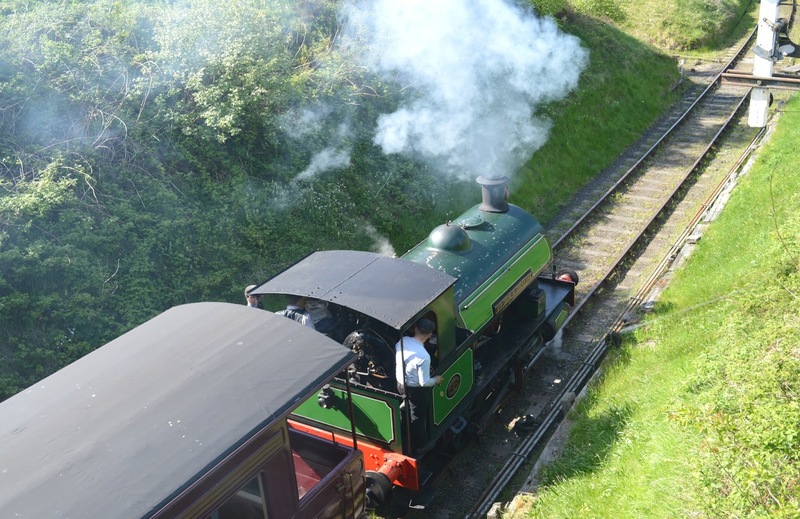 I couldn't believe how hot it was and it really made me realise how hard it must have been transporting coal up and down the line in the 1700s! Our whole journey took around 70 - 80 minutes and with a really smooth and efficient service we had plenty of time to fully enjoy our afternoon tea in that time. We didn't feel rushed at all and really enjoyed the food at a leisurely pace with plenty of opportunities to admire the views and take photographs. We both really enjoyed our day and I'm so happy that I finally got myself into gear to book the experience, it was one of the loveliest days out we've had in the North East. 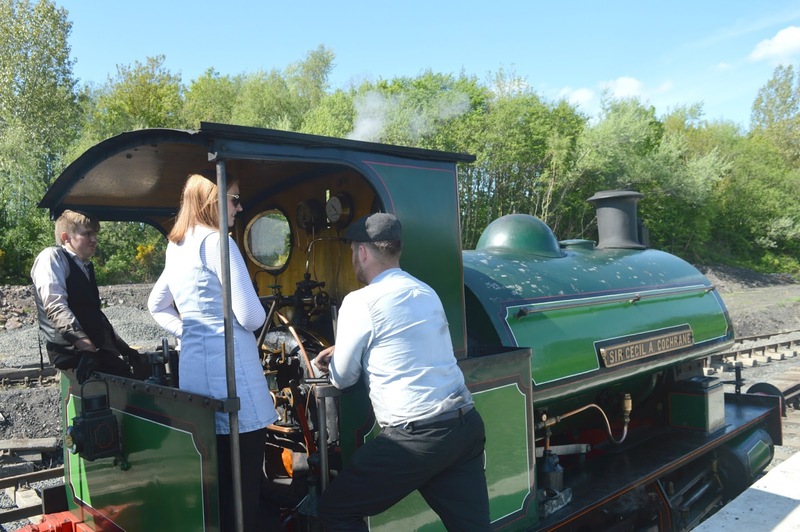 Afternoon Tea on the Tanfield Railway is served every Sunday and Summer Saturday until 27 August and costs £25.00 for Adults, £22.00 for Seniors and £20.00 for Children. Pre booking is essential! 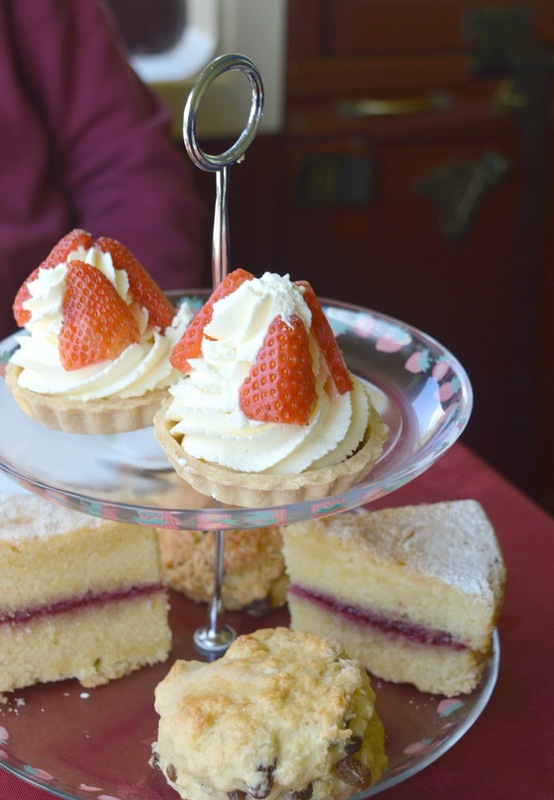 If Afternoon Tea isn't your thing then unlimited travel all day is £10.00 for adults, £6.00 for children and £8.00 for Seniors and there's a tea room, canteen and gift shop at different stations along the track so you won't go hungry! 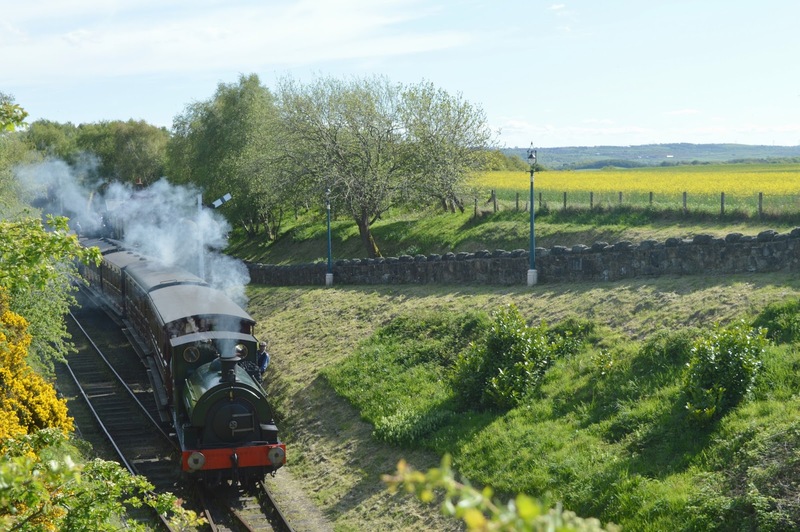 It's worth knowing that Tanfield Railway run loads of different events throughout the year including Murder Mystery Evenings, Heritage Open Days, Ghost Trains and the very popular North Pole Express. Discover more of their events here. If you want to see more about our trip then follow me on Instagram and check out my video highlights. Ah it looks so lovely Chloe - I am so pleased you picked such a wonderful day for it too. I can't wait to take Evan in the summer now (although we won't be booking afternoon tea with a toddler in tow and will take a picnic instead). What can we help you tick off your 40 before 40 list? House of Tides? I have to admit I've not checked it for a while! But yes House of Tides is definitely on there! It really was the best way to enjoy an afternoon tea - I'd recommend to anyone! Me too! It ticked a lot of boxes! I was so shocked by the lack of cream - pretty sure my jaw hit the floor!